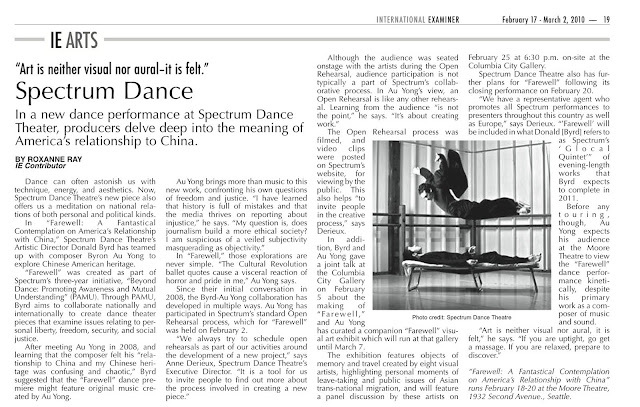 Roxanne Ray wrote a preview of Donald Byrd & Spectrum Dance Theatre’s upcoming production of Farewell: A Fantastical Contemplation on America’s Relationship with China. I composed the music performed by Paul Kikuchi, Tiffany Lin and me on Chinese percussion, cello, er-hu, bicycle wheels, cassette tape players and recorded soundscape collage. Working with Donald, the 13 dancers and the rest of the Spectrum creative team has been intense and revealing. In “Farewell,” those explorations are never simple. “The Cultural Revolution ballet quotes cause a visceral reaction of horror and pride in me,” Au Yong says.